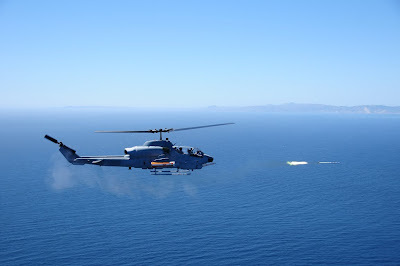 The Low-Cost Imaging Terminal Seeker is a Future Naval Capabilities product intended to equip the existing unguided Hydra-70, 2.75-inch rocket with a low-cost guidance capability. The weapon system will provide the warfighter with an effective means to combat the small boat swarm threat, also known as the fast attack craft/fast inshore attack craft (FAC/FIAC) threat. How does the LCITS work? Targeting data from launch aircraft sensors are transmitted via a digital smart launcher to the weapon. Rocket fly-out occurs under mid-course guidance provided by an IMU, and upon arrival in a search basket, transitions to identification and tracking of the target with an imaging infrared seeker as it closes for the kill. In their live fire test, Naval Air Warfare Center Weapons Division engineers used a shore-based launcher to fire two LCITS rockets, one inert and the other with an explosive warhead. Using inertial guidance, they flew to a point where the infrared terminal guidance system took over. Onboard imaging infrared seekers identified their intended targets among five maneuvering small boats. The rockets adjusted trajectories to intercept and eliminate two of the boats. LCITS will provide a tactically effective and cost effective means to combat the real asymmetric threat to U.S. and coalition naval forces posed by an adversary’s use of small boat swarm tactics. It will provide increased engagement capability, launch envelope, and probability of kill, while reducing exposure of the war fighter.